First Edible Garden, installed by Green Coaches, will be at 3815 Palm Tree Blvd. Santiago De Choch, owner of Green Coaches, is looking forward to installing more of the vegetable gardens throughout the area. Stop by and have a look. For information, call 839-1239. Spanish language story about an Argentinian cycling around the world. Pablo García no es un bonaerense cualquiera. En el 2001, a sus 27 años, decidió que quería recorrer el mundo y sin dudarlo demasiado abandonó su trabajo en una agencia de turismo y se despidió de su vida en Buenos Aires para emprender una aventura fantástica y casi literaria. Desde el comienzo de su viaje atravesó con su bicicleta -de 70 kilos- 61 países, las enseñas de los cuales porta con orgullo en dos mástiles que acopló a su vehículo. La última banderita que colgó, situada en la posición más elevada, corresponde a Pakistán, país que ahora visita y desde el que próximamente cruzará a la India para proseguir con su itinerario por Asia. En estos años, García vivió situaciones muy complejas como enfrentarse a elefantes, perderse en el desierto, recorrer 150 kilómetros en plena plaga de moscas tsé-tsé o un ataque a punta de machete de miembros de una tribu africana, según relató. Hoy, con más de 72.000 kilómetros en las piernas, Pablo partió desde Islamabad hacia la ciudad paquistaní de Lahore para continuar con su travesía por el mundo. "Voy a continuar hasta haber completado toda la vuelta (al mundo). Me motiva seguir experimentando cosas nuevas", expresó el argentino en conversación con la agencia de noticias EFE. Cuando llegue a la India, el aventurero se reunirá con su novia, una joven italiana, con quien pedaleará durante unos meses para seguir acercándose a su objetivo de conquistar el globo. Para ello, estima que le restan aún unos 50.000 kilómetros y cinco años de esfuerzo. Toni Ferrell and Bob Hale led a sizable number of bicycle enthusiasts in a "Ride of Silence", to pay tribute to cyclists killed or injured on the roads. The News-Press has a story and slideshow here. 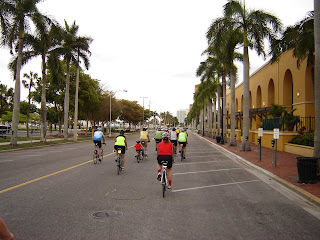 Anyone who has faced the dilemmas of sidewalks that end suddenly, distances almost impossible to negotiate without a motor vehicle, and dangerous bicycle riding conditions in Lee County, knows that urgent action is needed. 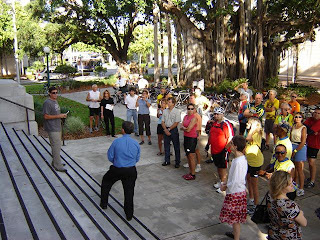 Last Friday, May 15th, National Bike to Work Day, at the Old Lee County Courthouse, Dan Moser of BikeWalkLee, a coalition working to complete the streets in Lee County, presented commissioner Judah with a petition, endorsed by over 800 residents, for the County to work towards making our streets and roads safer for pedestrians and bicycle riders. Dan Moser is with the Lee County Health Department in the Injury and Prevention Program as the Bike and Pedestrian Program Coordinator. 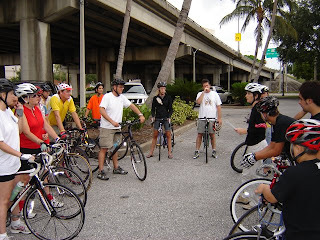 He is also active at the Florida Bicycle Association. Mr. Moser has been an advocate for more walking and bike-friendly communities for a number of years, and we have a debt of gratitude with him for his tireless efforts. His, however, is just one voice, and we need more citizen involvement and grassroots action to present an alternative to the old tired ideas of the "growth-at-all-costs" crowd: smart, compact, walkable communities, better transit, and real alternatives to just driving everywhere. In his comments, Commissioner Judah expressed support for the efforts of the group. "You are the mainstream", he told the crowd, as the trend, both nationally and worldwide, is towards a more rational use of energy through better urban planning and use of alternative transportation. He issued a quick recap of things that have been accomplished in recent years, but recognized that much remains to be done. Every time I see yet another lane being added to the highway, another overpass, or another gas station being built, I can't help but think that in many communities, both in the first and the third world, you can leave your home in the morning riding your bike, get to the train station and onto the train with it, and reach pretty much any destination in a short amount of time. There's a lot of places that have figured out that buying some bread and milk, getting a haircut or taking the kids to school are chores that don't necessarily have to involve driving a car - your own two feet are enough. If they can do it, I know we can do it. In the meantime, let's support the efforts of people like Dan Moser, Toni Ferrell, Darla Letourneau and everybody at BikeWalkLee, to make our own Lee County more bike and pedestrian-friendly.